After my 2017 wrap-up last week, I got a lot of messages from readers (Yeah, I have readers, big whoop, wanna fight about it?) and by far the most popular request from people who have been following this series for awhile was the Commander Heat Index. If you’re just joining the party, welcome. Also, the Commander Heat Index is a semi-regular series where I discuss various things you might do in a 75% context that might cause the whole table to decide you need to die first. The higher the score in the index, the more eyebrows were raised by your play. You may want to fly under the radar, you may want to signal the table that you’re about to try and win the game — how you play magical cards is up to you. However, this can serve as a guide to let you know how much heat you’re going to get if you do these things. Also, readers — argue with me on this. Don’t roll your eyes, go to the comments and tell me why I’m wrong. Share anecdotes about times things went very different in one of your games. Suggest future heat index targets. This segment seems to be a reader favorite so get on the winning team and really engage with it. I’ll do one of these a quarter if I get a good response to this one. Let’s look at some of the new things we got to do with Magic cards in 2017 and rank them on our index. 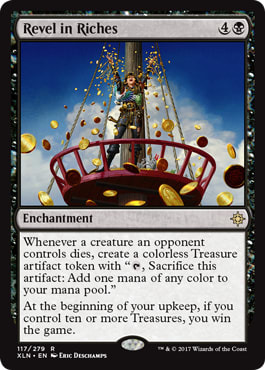 Notes: This can get scary because, even though you can deal with this with either artifact or enchantment removal, a bunch of treasure tokens are also a threat with Hellkite Tyrant and Revel in Riches. Revel in Riches is the problem here, but I’ve had people give me the people’s eyebrow for playing Mechanized Production, too. Notes: By now everyone realizes that this is something they need to deal with. You thought Black Market was good (it is)? Well this one kills people if they choose to bank the mana. This is one of my favorite Commander cards from 2017. Notes: This gets some hackles up for real. Try explaining that you’re a goofy storm deck, it doesn’t matter. People do NOT like counterspell commanders at 75% tables. Are they incorrect to react this way? Maybe. But I’ll tell you the same thing I told the guy who said his girlfriend cried when he countered all of her spells with his Talrand deck — sometimes being right isn’t everything. Notes: People are suspicious of this card. 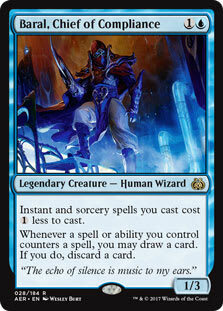 In fact, the only people who don’t seem to know that free spells mean trouble are Wizards R&D. As Foretold is good enough to get played in formats like Modern where players only have the mental capacity to remember 10 cards at a time (it’s fine, none of them are reading this) and that means it makes spider senses tingle when it’s cast in a degenerate format like Commander. Notes: This should maybe be higher. 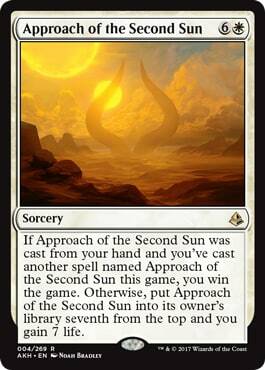 This is a dumb card to lose to in a format where presumably 3 people should be able to stop it. I never see people panic when this is cast and they should. 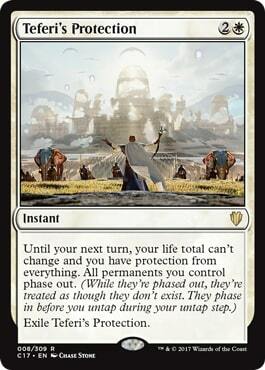 I like this in the Taigam deck I keep telling myself I’m going to build because if they can’t counter it, they’re really in trouble. Notes: People hate to play against this, and with good reason. Skullclamp is somehow better. Wheels are very good and people hate to get wheeled a lot. 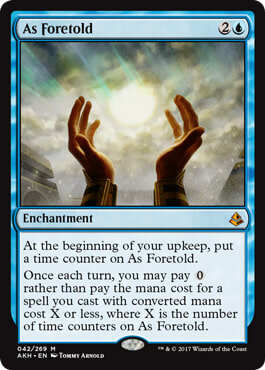 This is accidentally ridiculous with Mana Echoes, a card I was already watching because of tribal decks. 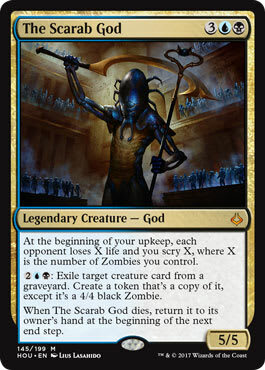 I don’t know if The Locust God is better than The Scarab God, but people are very upset to play against The Locust God. 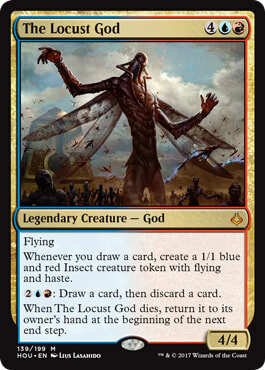 Notes: The Locust God should possibly be lower but this should possibly be higher. Hapatra reminded everyone that cards like Crumbling Ashes were a thing and made people like me lament that we couldn’t pair cards like Blowfly Infestation with Kulrath Knight like we used to in the old days. Well now we can use our Kulrath Knights and no one seems to care that the deck is drawing every card in it. This deck is too fair for competitive tables, but 75% decks rely on creatures a lot and this makes that hard. Also, no one cares. Notes: This should be higher. Zombies are good in Commander and this is probably the best zombie commander there is, granting you access to Blue and draining people while you scry. Maybe people where you play want to kill this with fire, but I haven’t seen an appropriate response to this monster, yet. 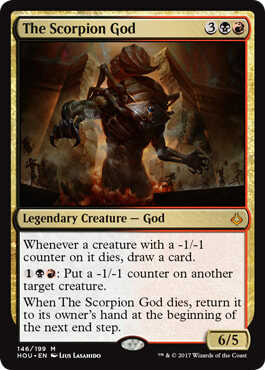 People tend to be more upset at an annoying commander like The Locust God than a stupid powerful one like The Scarab God. Exploit that knowledge. I expect some of you have good anecdotes about these gods to share. Notes: Two months ago this was a 4. This is quickly becoming a card that people don’t want to deal with and with good reason. 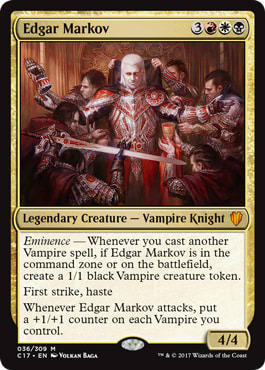 It’s sort of powerful if left unchecked and so many people have an Edgar deck these days that people are sick of seeing those stupid tokens everywhere. Notes: If done correctly, this won’t matter because everyone else lost the game except the person who tried to win. This card makes people very angry because it thwarts so many plans and sometimes exempts you from losing like everyone else did. 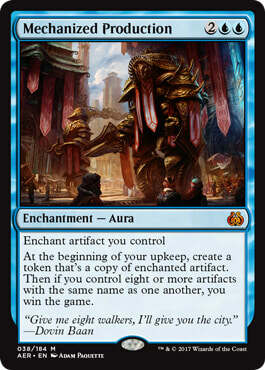 Usually they can’t do much about it this game but a steady playgroup will remember which deck has this card. Also, sometimes people like that you didn’t lose right away so the person that killed them didn’t win that they high five you for not losing. They get to root for you to kill the person who tried to kill the table. It’s really feast or famine with this card, but I think you should play it in lots of decks. I can see why people wanted me to do this again — I had a lot of fun doing it. Is there a card from 2017 I missed? Let me know. Disagree with my ranking? Let me know. Otherwise, make sure to head in 2018 well aware of some of the plays that will get some hackles up and play accordingly. 2018 promises a new Commander deck series, Masters 25 which will make some Commander staples more affordable, good tribal creatures in Rivals of Ixalan and some surprises we can’t even anticipate. 2018 will be a great year for Magic, so make sure to stay out of the kitchen if you can’t stand the heat. Until next time!